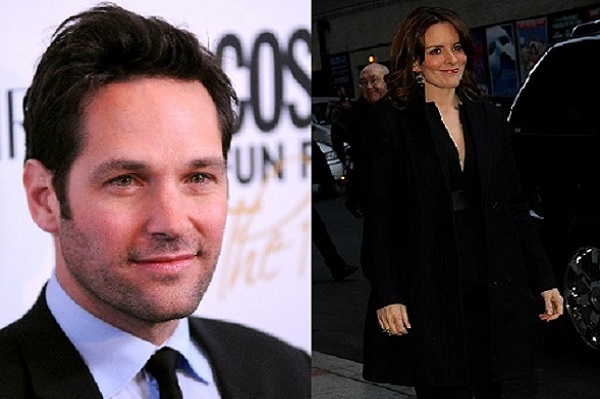 Paul Rudd rumored to star with Tina Fey! Paul Rudd is in talks to co-star with Tina Fey in a new film. Fey’s already signed on to star in Focus Features’ new comedy-drama Admission. Is this a match made in movie heaven? Seems likely. The ever-funny, extremely talented “hyphenate” writer-actress Tina Fey is set to star in a new film, Admission. Now, the internet is abuzz with talks that king of Mr. Nice Guy roles Paul Rudd will step into a co-starring role. Rumor has it that Rudd is in talks to co-star in Admission after recent news Owen Wilson passed on the project. Admission marks new mom Tina Fey’s return to the big screen after her most recent role as a married 40-something suburbanite on a big city adventure in 2010’s Date Night, co-starring funnyman Steve Carell. Prior to that, she was the voice of Roxanne in Megamind and played an unmarried woman hoping to conceive in Baby Mama in 2008. Rudd seems to be comfortable in the romantic comedy niche, having starred in Wanderlust, I Love You, Man and Dinner for Schmucks where he played the lovable, affable straight-man role so well. Rudd’s latest onscreen romp, Wanderlust, (co-starring Jennifer Aniston) failed to spark much interest at the box office despite its funny premise and the two leads’ star power. However, Rudd’s not slowing down. Projects slated for release later this year include the upcoming The Perks of Being a Wallflower and This is 40 written and directed by Judd Apatow. Rudd is currently filming Lucky Dog, co-starring Paul Giamatti, about two French Canadian Christmas tree salesmen who travel to New York as scheming con-men. Admission is being billed as a comedy-drama with Fey playing an unmarried, 40-something Princeton college admissions counselor who gets romantically involved with a man she knew while in college. Paul Rudd is in talks to play the love interest. The script is penned by Karen Croner and is adapted from a book by Jean Hanff Korelitz. Reports vary on the script’s story with some reporting Fey’s character falling for a young applicant to Princeton and Rudd’s character; and others stating Rudd’s character has harbored romantic feelings for Fey for years. Admission will be directed by Paul Weitz (About a Boy). Focus is planning to start production in the spring when Tina Fey will be on hiatus from 30 Rock. Maybe the onscreen chemistry between Rudd and Fey will prove to be more boon than bust (unlike the Aniston-Rudd pairing) at the box office for Admission.